The Hamper Was So Beautifuly Packed With a Sweet Hand Written Note ! I Personally lOve Hand Written Notes Which Comes Inside the Packages ! I Really have A Special Place In My Heart For the same ! 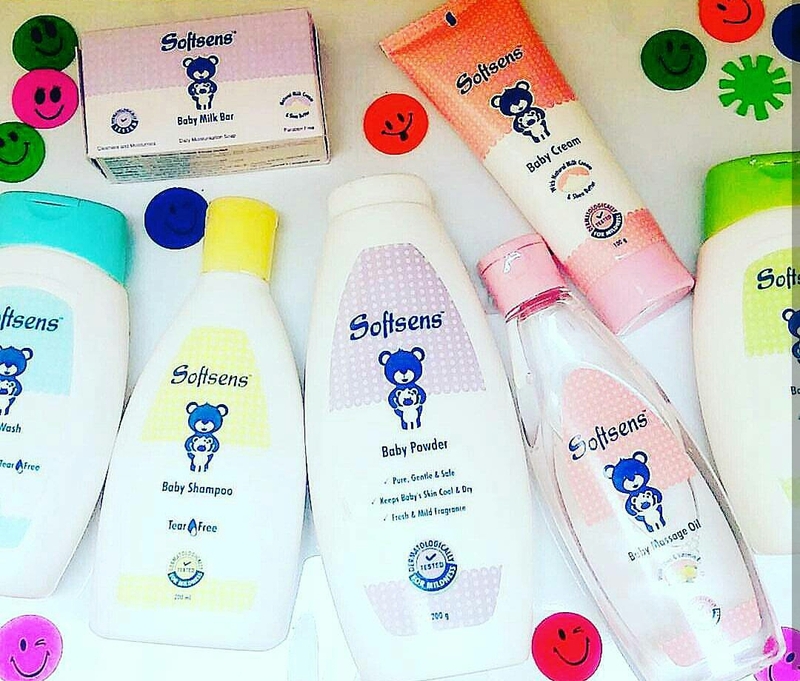 This Huge Stash of Baby products from Softsens is On my testing table from About 25 Days & Finally I Come Up with my Honest Reviews !! I Tried Each & Every Product inside the hamper On mY 23 months old Baby . Im Loving The Way It Protects My baby’s Skin Well & great , Even In This harsh Monsoon Season ! ?? ALL THEIR PRODUCTS Are ?? Im Highly Impressed With the Formula & Very Happy With The results !! So Guys , Today Im Here To Share All My Thoughts About these products & Sharing a Detailed Review of the Same ..
” Softsens Consumer Products Pvt. Limited ” Company Which Deals in All Natural & Organic Baby Products ( GMP Certified ) ! Their mission is to provide us with fun, convenient, safe, easy, efficient, sustainable, and affordable products to ensure that we have everything we need to make motherhood the most blissful experience of our life !! Let’s Get Started One By One ! COmes In A 200 ml Plastic Packaging Which Retails For Rs 110/- ..
Softsens Baby Powder helps absorb excess moisture, keeping your baby’s skin cool, clean & dry, yet soft & supple. Enriched with a mild & refreshing scent, it is gently formulated to help eliminate friction and control excess sweating, so that your baby stays cool, comfortable and happy. Keeps The Babies Skin Dry . Can Be Use as a daily post bath product ! Talc , Olive Oil Extract , Clove Leaf Oil, Patchouli Oil, Amyris Oil .. It Comes In A 200ml Green & White Plastic Bottle Which Retails For Rs 150/- . It’s A Non Greasy Light Formula , Very Gentle On Babies Skin ..
Softsens Baby Lotion moisturizes and cares for your baby’s skin like never before. Enriched with Natural Milk Cream and Shea Butter, it provides gentle daily nourishment for delicate and sensitive skin. Now you can have more soft snuggles than ever before! Natural Cream , Shea Butter , Natural Glycerine , Olive Oil Extract , Vitamin E ! It is Suitable for all Skin Types ! Softsens Baby Rich Cream helps keep your baby’s skin just the way it should be, soft, smooth and kissable! Enriched with natural milk cream and shea butter, this light weight non greasy formula, absorbs quickly into the skin leaving deeply nourished and moisturized. Softsens baby Shampoo is Specially Formulated with a ” Tear free formula ” for Cleansing your baby’s hair & scalp in the most gentle and caring manner. It’s Mild Ingredients will work together to nourish the hair and scalp , leaving it soft, fresh & sweetly scented ! It comes in 200ml transparent Plastic bottle which Retails for Rs 175 /- ..
Softsens Baby Massage Oil naturally nourishes your baby’s sensitive skin leaving them in a state of pure baby bliss. It is enriched with Vitamin E and Olive extracts, which help calm, soothe and condition the skin, to leave it supple, nourished and healthy. This light weight pure mineral oil formulation, contains rich emollients like ‘Sensolene‘ & Olivem 300 , which aids in long lasting skin hydration and helps to prevent evaporation of water from the surface. It Comes in a Blue & White 200ml Plastic Bottle which Retails for Rs 150/- ..
Softsens Ultra Mild Baby wash nourishes your baby’s skin with the goodness of Natural Milk Cream and Shea Butter, making it soft, supple and completely kissable! Its “Tear-Free” formula prevents skin and eye irritations, making sure that you and your baby fall in love with bath-time! It’s A Gel Based Cleanser With Natural Milk Cream & Shea butter . Mild On Babies Skin ! It’s a Pack Of 20 baby wipes which Retails for Rs . 65/- ! It Contains Aloe Vera & Vitamin E which cleanses & Moisturises the baby’s Skin well . They are mild and gentle, making them safe to use all over your baby’s body for soft, fresh skin. They’re so versatile, you can use them on anything from messy hands and damp bottoms to sticky baby toys, pacifiers and even for cleaning surfaces around the house. These Wipes are Multipurpose Which Can Be Easily Used By Moms Also ?? All The Products Mentioned Above Are 100% Natural & Safe For Our Baby !! I’m Using Them Regularly & We are happy with the Formula used & their Good Results !! His Skin Feels Soft & Refreshed all the time . The Products helps in Promoting Sound Sleep thus Also can be used before Bed Time ! All The Products Are Budget Friendly too ! I Will Highly Recommend These Products to all Mummas Out here ..
Me & My Kiddo had Already Given ***** Star Rating To this Brand & it’s Products from our side … ???? & Yes An exciting News Mommies , They Are Coming Up With Many More Interesting Baby Stuff Such as body Suits , Muslin Essentials , etc !! So Thx for reading This Post Guys , I Hope u find this review helpful . Have A Fabulous Friday Ahead !! Great review! There are soooo many products in the market these days that It can get confusing which one to buy- Reading such detailed reviews can offer some insight on the products and can give clearer pic to moms to buy the right product for the kids! Thx for Reading & your kind words . Totally admirable ! Abhi to mothers k pas kitne acche acche options hain, humare tym per to le de kar Johnson baby products hi thy ?? Chaliye mujhy to nahi meri bitiya k kaam aayega, ye sab main yaad rakhti hu ? Thanks for detailed review ?? I like the ingredients listed. All sound great for baby and mommy too. Thank you ! The products are good .